A nut-free and gluten-free version of a family favorite cookie. Soy butter and nut-free chocolate spread come perfectly together to create that peanut butter and chocolate flavor everyone loves. Disclosure: This recipe is sponsored by Don’t Go Nuts. The opinions are my own. 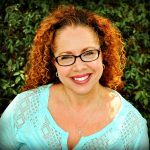 Being a gluten-free blogger, I am proud to be part of a larger community that advocates for all food allergies. All food allergies are serious and some are even life-threatening. For those facing nut allergies, there are several options for nut-free butter. I have had the opportunity to try several types of nut-free spreads and I fell in love with the Don’t Go Nuts spreads. I was thrilled when they asked me to partner with them to develop a cookie recipe with their spreads. 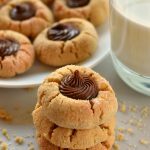 Thanks to Don’t Go Nuts for partnering with Mama Knows Gluten Free for this gluten-free Soy Butter Thumbprint Cookies recipe. If you’re new to the idea of “peanut-free peanut butter,” you may be wondering how to find the best peanut butter alternatives. Soy butter spread tastes very similar to peanut butter. Don’t Go Nuts organic soy butter is made from organic, non-GMO dry roasted soybeans; organic, non-GMO soybean oil; and sustainably sourced organic palm oil. It is packed with protein with 7-8g of protein per serving. Their soy butter also contains 4-5g of fiber per serving as well as iron and B vitamins. All five Don’t Go Nuts flavors, are certified organic, non-GMO, certified gluten-free, vegan and Kosher-dairy. You can find Don’t Go Nuts online, in stores and at their Amazon store! 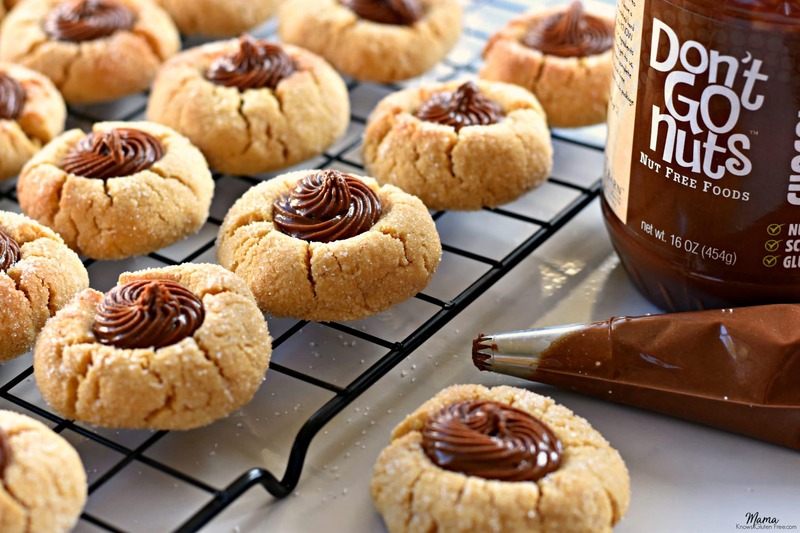 For the cookie’s centers, I choose to make a chocolate fudge filling using the Don’t Go Nuts Chocolate Spread. This filling would make a perfect chocolate frosting for cupcakes too. If you are a fan of hazelnut chocolate spreads you are going to love the Don’t Go Nuts chocolate spread! In a large bowl cream together butter, soy butter, brown sugar and the granulated sugar until light and fluffy. Mix in the pure vanilla extract and the eggs until combined. In a separate bowl, add gluten-free flour, xanthan gum (omit if your flour already has it), baking soda and salt. Stir until fully combined. Add the gluten-free flour mixture into the butter mixture and mix until combined. Cover the cookie dough and refrigerate for one hour. Add granulated sugar to a small bowl. Roll cookie dough ball in the granulated sugar and place onto a parchment-lined baking sheet. Use the back of a 1/4 teaspoon to make an indent in the center of the cookies. In a medium bowl mix the chocolate soy butter and powdered sugar until fully combined. 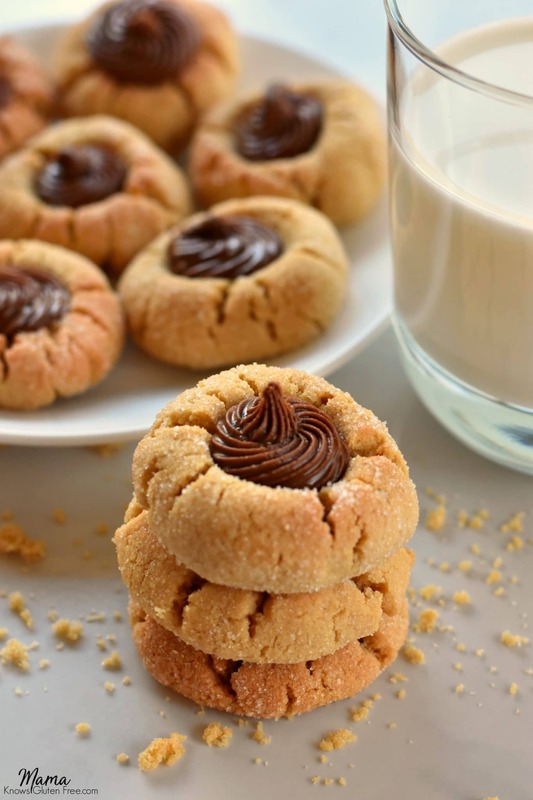 Use either a spoon or a piping bag to add the filling to the cookies. 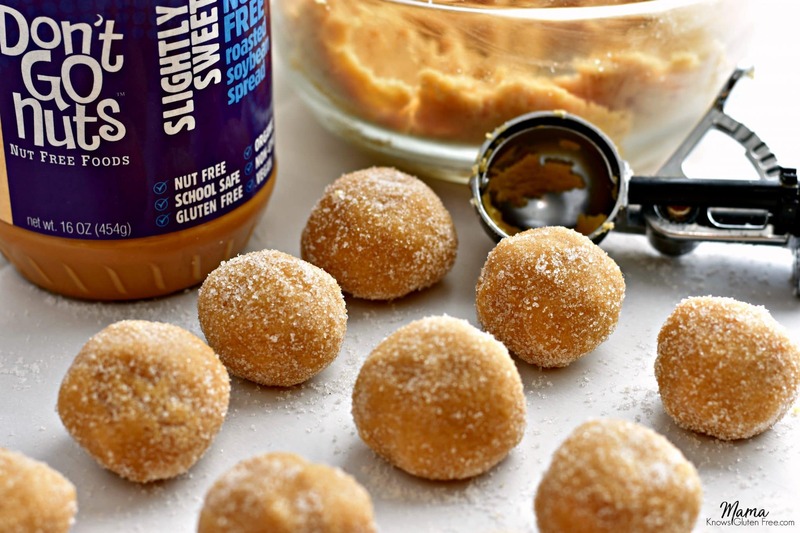 If you only want to make these nut free, could you use regular flour and skip the xantham gum? Hi Val! Yes, you could use regular flour and just leave out the xantham gum. Thank you so much for asking. I’m really liking the filling that you made for these cookies! Will the don’t go nuts and powdered sugar combo harden slightly or will it be soft? Will they be required to be in the fridge? Hi Amanda! You will not need to refrigerate the cookies. I live in Florida and just put them in an air-tight container. The filling does become firmer with the addition of the powdered sugar, much like thick frosting, but it will not melt. I was able to pipe it easily. Thank you so much for asking. Thanks so much! Excited to try this! You are so welcome Amanda! Enjoy! I guess I’ve been living under a rock. I’ve never seen the soy butter spreads. It certainly makes a delicious looking cookie! Thank you Leslie! To me the Don’t Go Nuts spread tastes really similar to peanut butter. Easy dairy free option! I appreciate that! Thanks Erica! Three of us are also dairy-free in my family so I try to make dairy-free options as much as possible. Such a clever use of the soy butter chocolate spread! My peanut free daughter is going to love these. Thank you so much! I hope she enjoys them. My kids loved them! Oh I bet these would be fantastic with my gfJules Flour – I can’t wait to try it! Such pretty pics too – hard to resist! I bet they would be amazing with your gfJules Flour! Thank you so much! That chocolate fudge filling looks so good! Don’t Go Nuts is an awesome brand! Thanks Kortney! I am a huge fan of all of the Don’t Go Nuts products. Their bars are amazing too. Look at that piping! Looks great! Thanks so much! It makes a great dairy-free frosting. You have no idea how in sync we are on cookies! I have been working on a recipe just like this – but mine doesn’t use chocolate soy butter – brilliant!! Thank you so much Alisa! The chocolate soy butter makes for an easy dairy-free frosting. Love Don’t go Nuts spreads and these cookies look delicious! Thank you! All of the Don’t Go Nuts products are great! Thank you so much! There are three of us in my family that are dairy-free so I try and do a dairy-free option as much as I can. I am only gf and always made thumbprint with jelly in the center. In an attempt to replicate my family’s version could I sub the spy butter with something that doesn’t have a peanut flavor? Regular butter? I’m going to try it with the nut butter too, I bet peanutbutter flavor with jelly is good as well! Hi Juli! If you are not wanting a peanut butter flavored cookie you could do a thumbprint cookie with this recipe and leave out the cocoa powder or use this recipe usisng sugar cookies instead. I love thumbprint cookies made with jelly too! I think peanut butter and jelly cookies sound yummy.